The sun has an intrinsic luminosity of 7026383000000000000♠3.83×1026 Watts. In astronomy, this amount is equal to one solar luminosity, represented by the symbol L⊙. 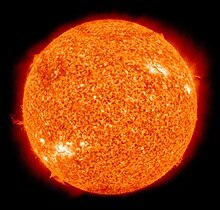 A star with four times the radiative power of the sun has a luminosity of 7000400000000000000♠4 L⊙. In contrast, the term brightness in astronomy is generally used to refer to an object's apparent brightness: that is, how bright an object appears to an observer. Apparent brightness depends on both the luminosity of the object and the distance between the object and observer, and also on any absorption of light along the path from object to observer. Apparent magnitude is a logarithmic measure of apparent brightness. The distance determined by luminosity measures can be somewhat ambiguous, and is thus sometimes called the luminosity distance. A star's luminosity can be determined from two stellar characteristics: size and effective temperature. The former is typically represented in terms of solar radii, R⊙, while the latter is represented in kelvins, but in most cases neither can be measured directly. To determine a star's radius, two other metrics are needed: the star's angular diameter and its distance from Earth. Both can be measured with great accuracy in certain cases, with cool supergiants often having large angular diameters, and some cool evolved stars having masers in their atmospheres that can be used to measure the parallax using VLBI. However, for most stars the angular diameter or parallax, or both, are far below our ability to measure with any certainty. Since the effective temperature is merely a number that represents the temperature of a black body that would reproduce the luminosity, it obviously cannot be measured directly, but it can be estimated from the spectrum. Blue and white supergiants are high luminosity stars somewhat cooler than the most luminous main sequence stars. A star like Deneb, for example, has a luminosity around 200,000 L⊙, a spectral type of A2, and an effective temperature around 8,500 K, meaning it has a radius around 203 R⊙. For comparison, the red supergiant Betelgeuse has a luminosity around 100,000 L⊙, a spectral type of M2, and a temperature around 3,500 K, meaning its radius is about 1,000 R⊙. Red supergiants are the largest type of star, but the most luminous are much smaller and hotter, with temperatures up to 50,000 K and more and luminosities of several million L⊙, meaning their radii are just a few tens of R⊙. For example, R136a1 has a temperature over 50,000 K and a luminosity of more than 8,000,000 L⊙ (mostly in the UV), it is only 35 R⊙. where A is the surface area, T is the temperature (in Kelvins) and σ is the Stefan–Boltzmann constant, with a value of 6992567036700000000♠5.670367(13)×10−8 W⋅m−2⋅K−4. that radiates equally in all directions. A hollow sphere centered on the point would have its entire interior surface illuminated. As the radius increases, the surface area will also increase, and the constant luminosity has more surface area to illuminate, leading to a decrease in observed brightness. is the distance from the observer to the light source. Luminosity is an intrinsic measurable property of a star independent of distance. The concept of magnitude, on the other hand, incorporates distance. The apparent magnitude is a measure of the diminishing flux of light as a result of distance according to the inverse-square law. The Pogson logarithmic scale is used to measure both apparent and absolute magnitudes, the latter corresponding to the brightness of a star or other celestial body as seen if it would be located at an interstellar distance of 10 parsecs .In addition to this brightness decrease from increased distance, there is an extra decrease of brightness due to extinction from intervening interstellar dust. By measuring the width of certain absorption lines in the stellar spectrum, it is often possible to assign a certain luminosity class to a star without knowing its distance. Thus a fair measure of its absolute magnitude can be determined without knowing its distance nor the interstellar extinction. ^ Hopkins, Jeanne (1980). Glossary of Astronomy and Astrophysics (2nd ed.). The University of Chicago Press. ISBN 978-0-226-35171-1. ^ "Luminosity | astronomy". Encyclopedia Britannica. Retrieved 24 June 2018. ^ "* Luminosity (Astronomy) - Definition,meaning - Online Encyclopedia". en.mimi.hu. Retrieved 24 June 2018. ^ "Brightest Stars: Luminosity & Magnitude". Space.com. Retrieved 24 June 2018. ^ a b c "Luminosity of Stars". Australia Telescope National Facility. 12 July 2004. Archived from the original on 9 August 2014. ^ Bahcall, John. "Solar Neutrino Viewgraphs". Institute for Advanced Study School of Natural Science. Retrieved 3 July 2012. ^ Mamajek, E. E.; Prsa, A.; Torres, G.; Harmanec, P.; Asplund, M.; Bennett, P. D.; Capitaine, N.; Christensen-Dalsgaard, J.; Depagne, E.; Folkner, W. M.; Haberreiter, M.; Hekker, S.; Hilton, J. L.; Kostov, V.; Kurtz, D. W.; Laskar, J.; Mason, B. D.; Milone, E. F.; Montgomery, M. M.; Richards, M. T.; Schou, J.; Stewart, S. G. (2015). "IAU 2015 Resolution B3 on Recommended Nominal Conversion Constants for Selected Solar and Planetary Properties". arXiv:1510.07674 [astro-ph.SR]. ^ Nieva, M.-F (2013). "Temperature, gravity, and bolometric correction scales for non-supergiant OB stars". Astronomy & Astrophysics. 550: A26. arXiv:1212.0928. Bibcode:2013A&A...550A..26N. doi:10.1051/0004-6361/201219677. ^ Buzzoni, A; Patelli, L; Bellazzini, M; Pecci, F. Fusi; Oliva, E (2010). "Bolometric correction and spectral energy distribution of cool stars in Galactic clusters". Monthly Notices of the Royal Astronomical Society. 403 (3): 1592. arXiv:1002.1972. Bibcode:2010MNRAS.403.1592B. doi:10.1111/j.1365-2966.2009.16223.x. ^ "ASTR 5610, Majewski [SPRING 2016]. Lecture Notes". www.faculty.virginia.edu. Retrieved 3 February 2019. ^ Delfosse, X; Forveille, T; Ségransan, D; Beuzit, J.-L; Udry, S; Perrier, C; Mayor, M (2000). "Accurate masses of very low mass stars. IV. Improved mass-luminosity relations". Astronomy and Astrophysics. 364: 217. arXiv:astro-ph/0010586. Bibcode:2000A&A...364..217D. ^ Karttunen, Hannu (2003). Fundamental Astronomy. Springer-Verlag. p. 289. ISBN 978-3-540-00179-9. ^ Ledrew, Glenn (February 2001). "The Real Starry Sky" (PDF). Journal of the Royal Astronomical Society of Canada. 95: 32–33. Bibcode:2001JRASC..95...32L. Retrieved 2 July 2012. ^ Singal, J.; Petrosian, V.; Lawrence, A.; Stawarz, Ł. (20 December 2011). "ON THE RADIO AND OPTICAL LUMINOSITY EVOLUTION OF QUASARS". The Astrophysical Journal. 743 (2): 104. arXiv:1101.2930. doi:10.1088/0004-637X/743/2/104. ^ Joshua E. Barnes (18 February 2003). "The Inverse-Square Law". Institute for Astronomy - University of Hawaii. Retrieved 26 September 2012. ^ "Magnitude System". Astronomy Notes. 2 November 2010. Retrieved 2 July 2012. ^ "Absolute Magnitude". csep10.phys.utk.edu. Retrieved 2 February 2019.